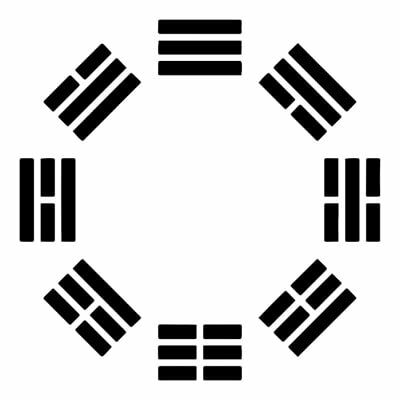 I Ching is one of the oldest oracular divination systems of the world based on ancient Chinese philosophy. It combines in itself profound wisdom and a practical philosophy, and has been practised and tested by Chinese sages for the past 5,000 years. It has nothing to do with any religious doctrine, but is based on the observation of nature and human life. It also observes how the concept of change manifests itself in the events that surround the individual, the family and the community. Counted amongst the great books of the world, I Ching or the Book of Changes occupies a unique position: It’s acts as a tool of divination; it’s a body of philosophy and a work of literary art. The I Ching has been in continual use in China for perhaps 5,000 years and still retains its place at the heart of the Chinese culture. Emperor Fu His (3,000 BC) is given credit for creating I-Ching. The other historic figure who contributed a lot to it is a prince called Wen. In 1143 BC, when Prince Wen was cast into prison by a tyrant. He produced the first written version of the I Ching, which translated in English means The Book of Life Changing. He numbered and organised the 64 hexagrams, which are the foundation of this system, and gave them titles and by long meditation on their inner significance arrived at a verbal expression of their basic meaning. Confucius, the famous Chinese philosopher also added lengthy commentaries to the I Ching and studied it intensively and seriously even in his old age. According to Chinese philosophy, the world is made up of five basic elements. All the species – animate or inanimate – that inhabit it are made up of these elements in various proportions. These ingredients change in the process of evolution in a uniform proportion with the advent of time The second fundamental building block of I Ching is the ancient concept of Yang and Yin, the complementary polarity of light and dark, creative and receptive, strong and weak, firm and yielding, male and female, positive, negative and so on. The principal powers of nature are all combinations of Yang and Yin. There are eight such powers, so their Yang-Yin balance is expressed in eight three-line combinations called trigrams. The power represented by these eight images makes up the natural universe. Hence on the basis of these two factors eight visual images or trigrams namely the Dragon, Earth, Thunder, Water, Mountain, Wind, Fire and Lake were devised to express the way nature functioned. To make these symbols manageable, a brilliant code was invented based on the ancient polarity of male and female or active and passive, which the Chinese call Yang and Yin. ( ____ ) , and Yin was expressed by a broken line ( __ __ ). Just as a computer needs only the two symbols 0 and 1 to express any data fed into it, so the ancient Chinese found that they needed only the Yang and Yin lines to express their eight images. Manipulating these symbols, Fu His discovered that the eight simple trigrams could be combined in 64 hexagrams expressing 64 aspects of life and its changes. Based on this, the Chinese diviners symbolised these stages into 64 life situations, each situation developing into six steps of linear symbols of Yin and Yang broken and unbroken lines. Each six-lined figure formed is a hexagram. And from this highly precise binary grid of 64 life situations, and their 4096 (64 x 64) mathematical inter-relationships, namely only one among the 4096 answers in possible for any single question or event. As mentioned in the first part, the principal powers of nature are all combinations of yang and Yin. There are eight such powers, so their yang-yin balance is expressed in eight three-line combinations called Trigrams. These trigrams are linked to the forces that make up this universe. Here’s a description of them. Symbolised by three unbroken or yang lines – this trigram is called Ch’ien or the Dragon. It is entirely yang and represents the positive, masculine creative force. As the creative principle, the dragon is seen as the father of all things and in Chinese mythology controls the clouds and the waters. This trigram rules over attributes like action, creativity, courage, dynamism, happiness and people or individuals of high status. The rulers of the state, the clergy, and all other important people come under this category. Its importance is parallel to that of the sun in astrology and is symbolised by the tiger, horse and lion. Physically it rules the head, the mind and the pineal gland which is the seat of all knowledge and wisdom. Symbolised by three broken or yin lines, this trigram is called K’un or the Earth. The Earth is entirely yin or feminine and represents fertility. As the creative principle, she is the mother of all things and she is dark and devoted, and warm and receptive. It rules over attributes like receptivity, reverence, caution, modesty, humility, obedience and respect. It also stands for all things swayed by emotions like the masses, big groups and congregations. Older wise women are also ruled by this trigram. It is the extreme opposite of the Dragon and the creatures symbolised by it are also tame and domesticated – like the cow, mare and the ant. It rules over the abdomen, the womb, the stomach and the lower region. Symbolised by two yin and one yang line, this trigram is called Chen. It represents a state of turbulence, shock and arousal. It symbolises the eldest son in the family and the beginning, renewal or birth of an idea, event or individual. This trigram indicates a fresh new perspective, a new outlook, a pleasant surprise or an improvement in a situation. It indicates the eldest son in the family and the parts of the body it rules includes the feet and the liver. It deals with all modes of communication – whether it’s radio, TV, the NET or anything else. It signifies energetic and dynamic men in the age group of 23 to 40. Symbolised by two yin lines on either side of the middle yang line, this trigram is called K’an – Water or the chasm. It represents danger or a deep pit. Confined activity in narrow limits and a struggle is also indicated. It’s related to close inter-personal activities, worries and hidden crimes and robberies. As a family member, it represents the middle son, or troubled men aged 16 to 22. It also indicates people who are troublemakers and evil. The direction ruled by it is the north, and it rules over the ears, kidneys and the excretory system. The places ruled by it are generally water bodies like rivers, wells and waterfalls. Symbolised by one yang line and two yin lines, this trigram is called Ken or the mountain. It represents the youngest son and rules over attributes like stillness, inner poise, inner perception and introspection. This quality has both positive and negative aspects, representing the highest peak of spiritual attainment and an obstinate refusal to move. On the negative side, it indicates stubbornness, candour, savings, frugality and on the positive side inner perception and introspection. It rules over men under 16 years of age and the parts of the body ruled by it are the hands and the back. Symbolised by two yang and one yin line this trigram is called Sun, and represents softness. In the family, it represents the eldest daughter and rules over the attributes of reflection, concentration and penetration. It rules over women in the age group of 21 to 40 and presides over intellectual activities. Wind or wood, the eldest daughter represents gentleness. This quality has positive and negative aspects representing persistent endeavour and timidity and indecision. The parts of the body ruled by it include the legs, nervous system and the respiratory system. Symbolised by a yin line outlined by two yang lines this hexagram is called Li – the Fire and stands for the middle daughter. Ruling over women in the age group of 15 to 20, it represents warmth, clarity and affection. It rules over beautiful, wise and intelligent people who are enlightened and show the path of knowledge to the others as well. On the physical side, it rules the eyes, blood system and the heart. It also controls intelligence and sound judgment, and all sorts of creative vocations. Symbolised by one yin line and two yang lines, this trigram is called Tui – Lake or the youngest daughter. It represents joy, purity and truth. It rules over women below the age of 16, as it stands for innocence, and young and immature people. Its positive attributes are recognition of spirituality and joy, and it also rules over music, art and related activities. The physical parts of the body ruled by it are the mouth and the organs of speech.